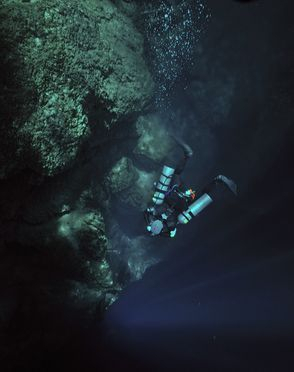 Sidemount diving has been around for decades but was used mainly by extreme, technical divers who used the configuration to penetrate small sections of caves. 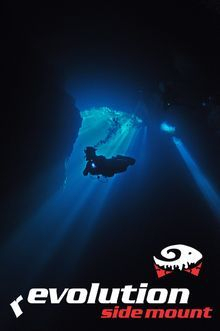 Only recently have its adaptability and advantages been discovered by divers of varied experience levels and, due to advances in equipment and greater availability of training, sidemount diving is becoming an increasingly common application for both recreational and cave divers. Sidemount diving began in England in the 60’s to allow divers to squeeze through tight spots while exploring sumps. 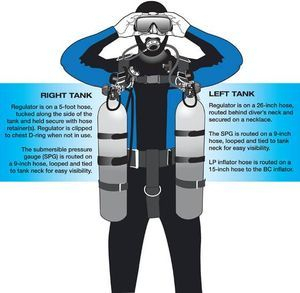 Divers brought the technique to the United States in the mid 70’s for the same purpose and in the early 80’s divers began to use sidemount to reach lower and tighter places that were too low for conventional back mounted tanks. It is also very popular in Mexico as a method to reach sumps in dry caves or entrances requiring long treks horizontally or vertically and to go through tight spaces during cave exploration without disturbing the environment. Sidemount is a gear configuration in which a diver uses two independent tanks and regulators which are connected to the body on each side via a harness instead of mounted on the back. The tanks lie parallel to the body and each tank is connected at two points. The bottom of the tank is connected to the harness with a clip near the diver’s hip/kidneys and the top of the tank is secured with a bungee/cord at the top of the shoulder such that the tank valve hangs under the arm. This configuration provides the diver with two separate and redundant sources of gas since the tanks are not connected by an isolation manifold, as they are in a backmount configuration. There are several advantages of sidemount diving. Cave divers soon realized that wearing tanks on the side of the body created a lower profile in the water thereby allowing them access to smaller spaces without disturbing the environment. They also discovered that they could push a tank ahead of them through smaller cave passages by simply unclipping the bottom portion of the tank from the buttplate in order to find more cave. More importantly, whether diving a cave, wreck, or reef, every specialty recognizes the safety benefits of sidemount diving. A sidemount configuration provides a completely redundant and independent air system with the valves, regulators, and hoses in plain view and easy to reach in case of an emergency, which is very reassuring. Further, the position of the tanks also gives the diver's head greater range of motion for enhanced vision and comfort. Further, a diver on sidemount is much more streamlined, which means less effort moving through the water. Another benefit is that buoyancy and trim become a lot easier as well—and the sidemount rig lets the diver adjust the trim in the water. Another advantage of sidemount configuration is the management of what can be a heavy load. Considering that the average technical rig weighs approximately 60 kg (130 lbs) it makes it easier for physically challenged or older divers, and petite women to transport tanks individually to the water. The system also allows for the tanks to be put on and taken off in water which reduces the weight burden significantly allowing divers to enter and exit the water with the same ease. Read more about our sidemount diver course or contact us to receive more information about sidemount diving or to make a reservation.